Alright, I'm falling way behind on my beer reviews even with this diet curtailing my drinking habits. Time to get back on it, here's one from Stone which can now be found in many BR stores including Calandro's, which is where I picked it up if I remember right. Stone is one of the newer breweries to our market and it's a damn fine one, even considered by some to be the best brewery in the world. That's a little subjective for my tastes (plus I don't have enough basis for comparison) but let's all agree that it's in contention. I poured this one from a bomber into an imperial pint glass as you can see. It pours a super dark color, damn near black but maybe a little bit of brown. Huge creamy tan head, lots of lacing and great retention. It even overflowed a bit, I hate to waste beer like that, damn! It smells like smoke, for sure... hard to place the exact flavors but it smells like a Pacific NW salmon being smoked... at least that's what comes to mind. 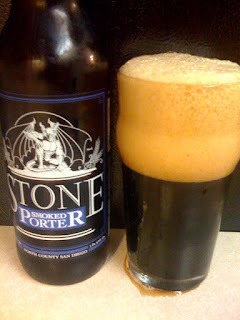 The taste hits up front with a little bit of chocolate before the smoke flavor takes over... and then lingers a bit. It's good but I expected more. The beer is a little more watery than I would like to see too... but still has a decent mouthfeel. Medium marks for drinkability... the smoke flavors are a little on the strong side and it might throw some people off. This one definitely isn't for the faint of heart... it's a bit extreme on the smoke flavors and certainly not a session beer, but for anyone looking to try new beers, definitely pick one up.